CHIIYAAM is an algonquin word which means “peace”. The perfume is thus named because of its relaxing, calming and serene properties. It works rapidly and with efficiency on the person who uses it as well as on his environment. Many therapists use it in professional sessions or after the session to purify the space. It is a complement to MIWAHu, the energizing Native Essence. 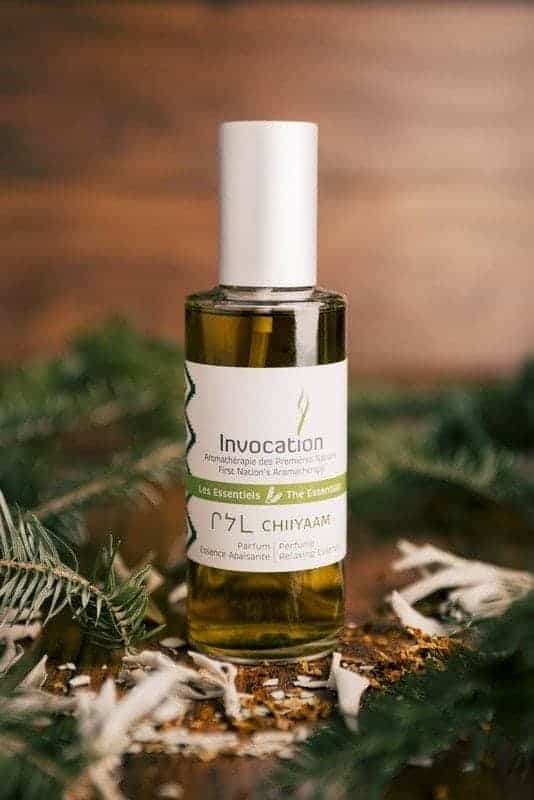 First distributed under the name “Invocation Liquid Smudge”, CHIIYAAM is the first product created by Blue Eagle, aboriginal shaman who wanted to find an alternative to smudging, that is not always well adapted to our modern way of life. 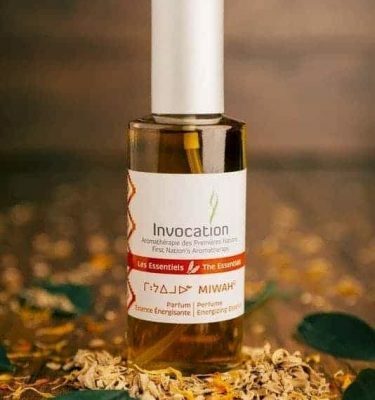 In his research to create this product he studied with the french perfumer Michel Roudnitska and with the essential oils specialist, Mikaël Zayat. After several years of researche the First Native Essence was born. It quickly proved its efficiency and far from being diminished over the years, is enriched by many new uses that were discovered by its fans. CHIIYAAM distinguished itself among all aromatherapy products by the care given to the beauty and homogeneity of the fragrance. This scent is masculine, because of the predominance of cedar and two varieties of sage. 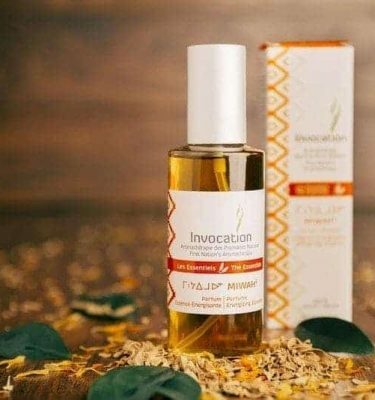 It is because of these oils that Chiiyaam’s headnote produces an immediate purification. Its composition and benefits make it a unique product unparalleled in current aromatherapy products. The perfume is prepared in the Invocation plant by hand, in small quantities, in a manufacturing process that lasts fourteen months. Altogether, it contains 17 essential oils and plant extracts, all picked respectfully for nature’s renewability. It is a 100% natural plant product in which every ingredient plays a precise role and contributes to it’s overall beneficial effects. This perfume’s scent is evocative of the power of the great original forests of Canada. Alcohol, Cedar, Lavender, Red Mandarin, Spearmint, Hemlock, Rosemary, White Sage, Cistus, Olibanum, Sandalwood, Tobacco, Spikenard, Juniper, Desert Sage, Rose, Sweetgrass, Water. Each plant extract has a specific signification and use. Blue Eagle’s treatise Sacred Scents and Mystical Music introduces them all. CHIIYAAM is an essence which purifies the ambient air as well as the electromagnetic field around its user. Its effects are used at night as well as day, since this Native Essence allows for a restful and remedial sleep. Its soothing characteristics makes it a great way to start the day with calm and confidence. It will optimize a personal work session like yoga, meditation, relaxation, etc. Because it promotes relaxation and harmony, it helps people who uses it to center and by that, to be more efficient and inspired, whatever the circumstance. The perfume is available in spray, in 15, 29 and 120 ml, or in a 100 ml refill bottle. Also available with the other perfumes in 10ml in the discovery kit. To feel its immediate effects, we put a few sprays on our palms, put our two hands together so they both have the perfume and then bring our hands around us, in the aura or what is better described as the body’s electromagnetic energy field. We can spray it on our clothes or a piece of fabric that we carry with us or on our pillow. It is also possible to spray it in the ambient air around us, in the work place, or in a room before a meeting. It can transform tensed or heavy moods because it purifies places as well as individuals. Finally, it can be worn, like all other perfumes, on the skin: a few drops on the wrists or behind the ears. CHIIYAAM CALMING BATH SALTS, with CHIIYAAM essences extend the relaxing effects that produces the original perfume. We get great wellness because it cleans body toxins. To approach calmly an important activity. Before bedtime, to allow a restful sleep..
Spray it, in ambient air, around yourself. CHIIYAAM is beneficial for health and on all plans. Several testimonies have come to our attention by mentioning an improvement in respiratory and acute problems , Other people mentioned getting results at work et at home.In their social and family relationship, in a context of therapeutic intervention,etc. All of them admit that perfum has priceless properties. I love this scent of this oil, it is calming, but refreshing, relaxing but awakening also. I work at a Physiotherapy & Massage clinic and we use this daily. Now getting for my personal home space. Love This Product!!!! CHIIYAAM est bénéfique pour la santé en général et sur tous les plans. Plusieurs témoignages nous sont parvenus mentionnant ainsi des améliorations sensibles à des problèmes respiratoires chroniques et aigus. D’autres évoquent des résultats manifestes obtenus au travail ou à la maison, dans leurs relations sociales ou familiales, en contexte d’intervention thérapeutique, etc. Tous s’entendent pour reconnaître au parfum des propriétés inestimables. This is the only smudging spray I will use in my personal and professional practice, for clearing and protection. It is light and the scent is uplifting, calming and fresh. My students and clients all love it. 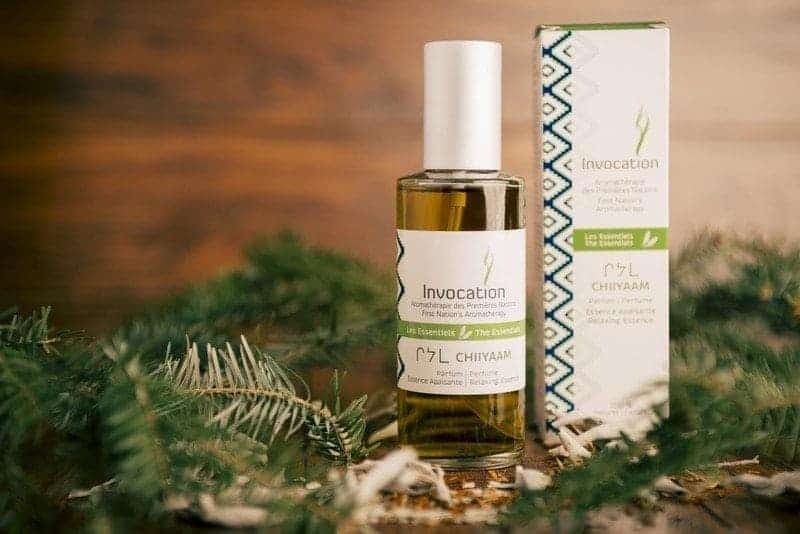 Chiiyaam est une bénédiction; ainsi que le créateur qui a formulé ce beau parfum apaisant. Je continuerai à l’utiliser personnellement dans le cadre de ma pratique spirituelle quotidienne et professionnellement pour la protection de mes participants lors des sessions de groupe Geobox.